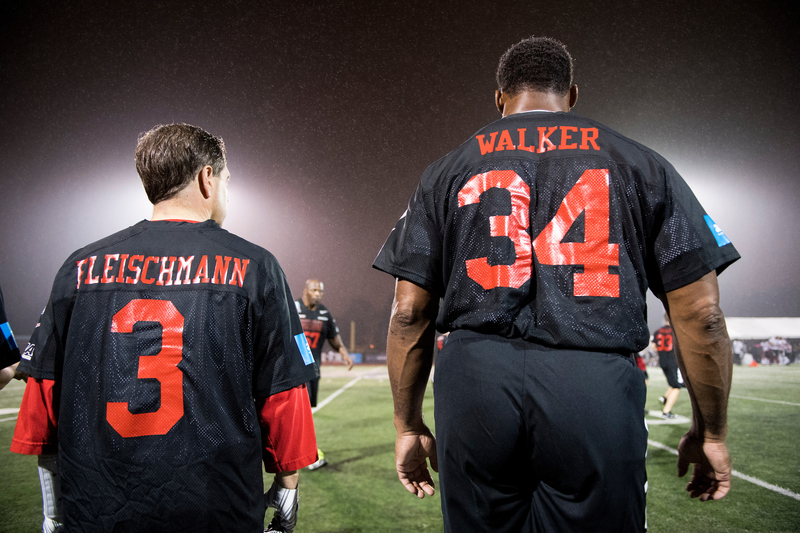 Even Santana Moss and Herschel Walker couldn’t help the members’ team. The Capitol Police won the Congressional Football Game for Charity, 7-0, their fourth consecutive win. The highlight came at halftime of Wednesday night’s rainy game, which raises money for the U.S. Capitol Police Memorial Fund, among other organizations, when Majority Whip Steve Scalise of Louisiana made an appearance. Entering the stadium at Gallaudet University before halftime, Scalise greeted officer David Bailey, who was wounded while protecting him when a gunman opened fire on the Republican team’s practice ahead of the Congressional Baseball Game in June. Scalise was hospitalized after the shooting and only recently returned to the House floor. Bailey played in the football game, and his partner on Scalise’s security detail, Crystal Griner, was there to watch. Scalise gave both officers white jerseys that said “Thank You” on the back. Illinois Rep. Rodney Davis, who was also at the Republican baseball practice, presented them with a football signed by the NFL players on his team. The Guards gave Scalise and the members’ team captains, Reps. Tim Walz of Minnesota and Jeff Denham of California, a badge inscribed with all their names. The Mean Machine’s coaches — Ken Harvey, formerly of the Washington Redskins, and John Booty, formerly of the Philadelphia Eagles — also received a badge, along with Walker. While Walker, Harvey and Moss played most of the game while directing members on the field, the Capitol Police team scored their winning touchdown in the first quarter. Moss confused fans in the stands by starting the game in a white shirt, the same color worn by the Guards. He then put on a black Mean Machine jersey. During warmups for the second half, after the ceremony with Scalise, an announcer informed the crowd that the Washington Nationals had beat the Chicago Cubs in Game 4 of their division series game, prompting cheers. Several members of the Mean Machine tied their cleats with bright green laces. While most players wore jerseys sporting their last names, Massachusetts Rep. Joseph P. Kennedy II wore a jersey with “Joe” on the back, and Kansas Rep. Roger Marshall went with the name of his home state. The son of Arkansas Rep. Rick Crawford, outfitted in a “Crawford” jersey, rooted for his father on the sideline. 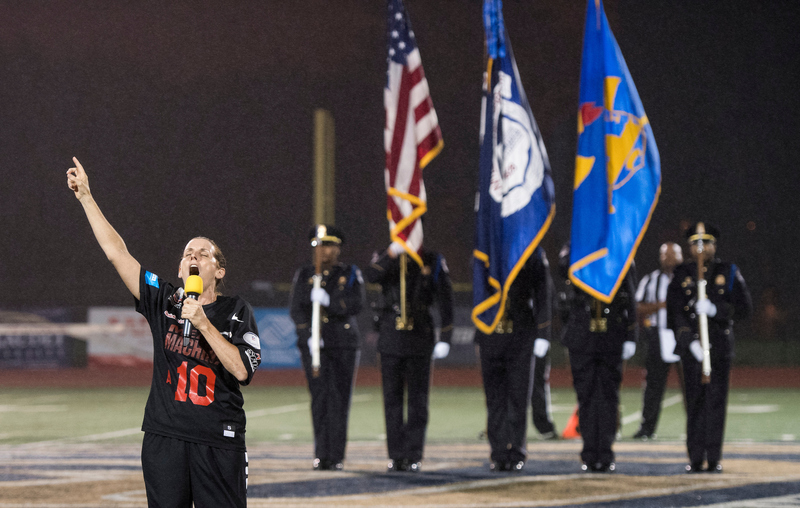 Two women played on the members’ team – Reps. Nanette Barragán of California and Rep. Martha McSally of Arizona, who sang the national anthem. By the end of the fourth quarter, members had begun to take photographs with Walker, formerly of the Dallas Cowboys. Harvey jokingly scolded them and told them to pay attention. After the game, members and Capitol Police officers got autographs from the former players. Along with the U.S. Capitol Police Memorial Fund, proceeds from the game will benefit Our Military Kids and A Advantage 4 Kids. The Congressional Football Game for Charity is played every two years, to avoid election years.